At Floating Pontoon Hire we have assembled a highly skilled installation team made up of both full time employees and freelance staff. Dependant on the requirements of each job we call upon our team to ensure jobs are delivered when the client wants, where the client wants and to our own exceedingly high standards. However, even with such an extensive crew list there are times when demand simply exceeds supply and we’re left short handed. Thankfully on such occasions we have a contingency plan in place, that contingency comes in the form of Five Star Crew Company. Five Star provide highly skilled, hardworking crew and have national coverage with offices in London, Bristol, Birmingham and Manchester. 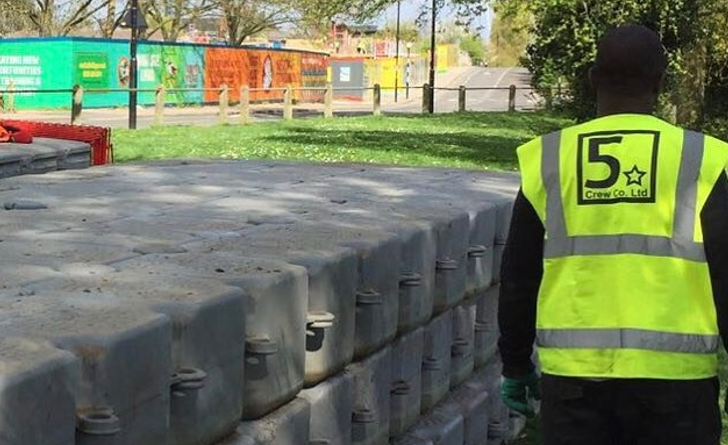 They offer a value for money service offering specific skills such as plant operators, set builders, follow-spot operators and emergency first aiders and now pontoon installers! We’ve worked with Five Star for over 2 years now on a variety of projects and they’ve delivered a faultless service each and every time. We’ve had crews of 2 guys up to 10 guys for 2hrs to 12hrs so they are able to accommodate our needs and often at late notice. On one occasion, one of our in house crew was taken ill overnight. A call was made to Director Ed Driver at 0600 in the morning and Five Star had a replacement crew member onsite in Central London within 2 hours! You can’t ask for better than that. Its incredibly reassuring to have a supplier you know you can call upon when needed, who deliver such a high quality service.